This series presents information based in part on theory and conjecture. The producer’s purpose is to suggest some possible explanations, but not necessarily the only ones to the mysteries we will examine. — Opening Narration to In Search of . . . In Search of . 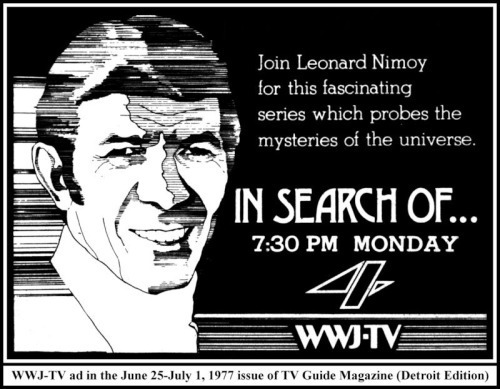 . . was a weekly documentary series that aired in syndication between 1977 and 1982. Produced by Alan Landsburg and narrated by Leonard Nimoy, the program explored fringe topics popular during the 1970s — everything from Bigfoot and Killer Bees to Atlantis, auras, biofeedback, the Bermuda Triangle, Easter Island, reincarnation, and UFO’s. During the course of the series, 144 30-minute episodes and four hour-long specials were produced. The complete series and the specials are available on an Aeolus 13 Umbra YouTube channel dedicated solely to the series. See below for a complete listing of links to each episode. The origins of In Search of . 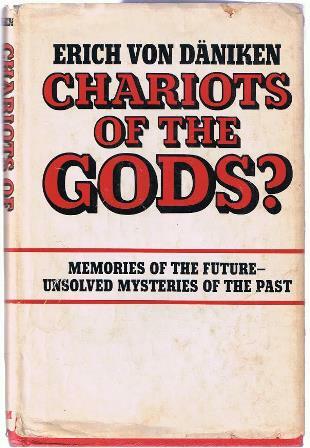 . . date back to 1968 with Erich von Däniken’s bestselling book, Chariots of the Gods?, which attributes some of humanity’s crowning achievements and enduring mysteries, such as Egyptian pyramids and Stonehenge, to alien influence. The same year, the film 2001: A Space Odyssey is released, and its main plot involves aliens influencing human evolution. 1968 also saw the release of Planet of the Apes, where astronauts return to a dystopic future Earth humans no longer rule. Alan Landsburg, and others, identified a growing sub-current in Western culture and moved to tap into it. A whole new genre in book and film was established and quickly proliferated over the next decade. As man landed on the Moon in 1969, many asked the question whether an alien civilization ever visited earth. This was not entirely an unreasonable question to ask; however, the “aliens must have did it” explanation applied to anything we do not understand has the effect of diminishing the very real achievements of ancient cultures and indigenous peoples in Africa, Asia, Central and South America, and Europe. 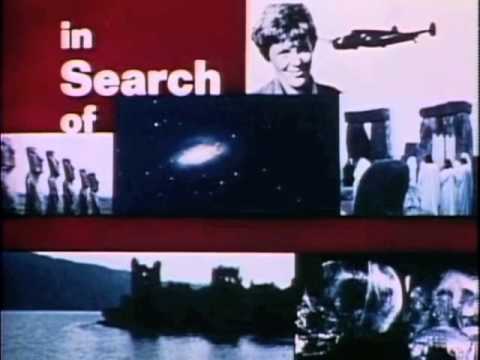 Prior to the series in 1976, Alan Landsberg produced several hour-long TV specials based on von Däniken’s works, including In Search of Ancient Astronauts and In Search of Ancient Mysteries, both in 1973, and The Outer Space Connection in 1975. All were narrated by Rod Serling, who was also slated to work on the series until his untimely death in 1976. These programs are probably the best of their type ever produced, expertly blending on-location footage, Serling's narration, and an ambient soundtrack. A fourth film, Manbeast! Myth or Monster, released in 1978 at the height of series’ popularity, is less successful. The film investigates creatures like Bigfoot and the Yeti, but the story tends to ramble. 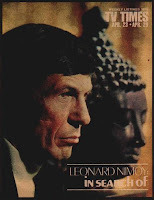 Nimoy was not tapped to handle the narration and the person filling in, while certainly professional, lacks the gravitas and connection to Sci-Fi that Nimoy provides. Nevertheless, the film is a good record of the era’s fascination with cryptozoology. Click on the links above to view the films on the Aeolus 13 Umbra ISO YouTube channel. As would be the case with the series, production teams for the specials went worldwide gathering footage. Film, as opposed to digital video, has a warmth about it, a dreamy effect that provides an almost timeless quality. The soundtrack utilizes ambient music to produce a relaxing, almost meditative space for contemplating the topics at hand. The episodes linked below are from digital video masters, but true fans may wish to check out my earlier article, In Search of . . . The Complete First Season, which features 16 mm film versions recovered from the archives of a television station. Run through a projector, the film has a slightly different quality and more closely shows what audiences in the 1970s experienced. 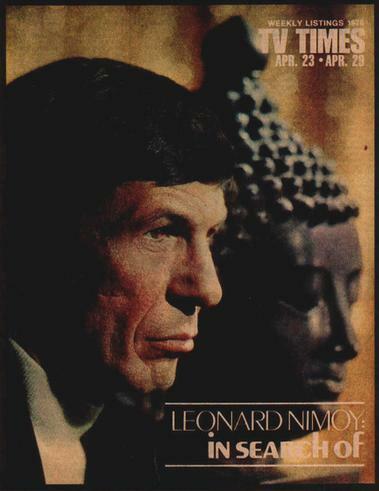 The series draws upon the production values established in the films, and Leonard Nimoy is a seamless replacement for Serling who nonetheless establishes his own rhythm and pace. Not all the episodes explore fringe paranormal topics; many cover historical or environmental topics with the same focus on accuracy and detail as a National Geographic special. The episodes on Dracula, Inca Treasure, Killer Bees, Michael Rockefeller, Vincent Van Gogh, Pompeii, Tidal Waves, The Lost Colony ofRoanoke and numerous other entries, are excellent short-subject educational films that introduce viewers to little-known subjects. While I do not subscribe to tales of alien astronauts (as discussed in my article, In Search of . . . Preposterous Explanations), I still have a great love for the series. The combination of the writing, Nimoy's narration, on-location filming, reenactments, and audio production set an industry standard. Over the course of 144 episodes, the show covered a wide range of popular and obscure cultural interests of the 1970s. The typical episode averages a little over 22 minutes — providing just enough time for an overview of the topic and limiting the amount of conjecture, which tends to get repetitive. The program reports, but does not prove or disprove claims. We're introduced to the story, and left to decide for ourselves its veracity. Certainly, however, many episodes do tend to be steeped in unsubstantiated claims. The music by Laurin Rinder and W. Michael Lewis could have been a mistake, but instead was a boon. The LA-based production team was known at the time for their work in disco, not documentary filmmaking, yet the duo turns in the classic opening theme that immediately identifies the show. The synthesizer and orchestral elements are skillfully used to highlight both the drama and mystery of the series as well as give room for reflection in quieter moments. An LP of the series soundtrack was released in 1977 by AVI Records. The program turned out to be the height of their career, and Rinder & Lewis broke up in 1982 when the series ended. In Search of . . . still retains an active fanbase. Visual Entertainment released the entire series on DVD in in 2012, which also included the short-lived 2002 series hosted by Mitch Pileggi (of The-X Files) on the Sci-Fi Channel. More recently, the History Channel announced in January 2018 a revival of the show with Zachary Quinto as host, who also replaced Nimoy as Mr. Spock in Star Trek. Nevertheless, the magic of the original series is hard to recreate. Like lightning in a bottle, the series captured the cultural zeitgeist of the times. As we opened up the future, we looked to the past for hints about where we are going as a species. Have there been civilizations lost to history? Are there terrifying creatures we’ve yet to discover? Is there intelligent life on other planets? The answers are out there, and what they reveal about us is still worth going, dare I say, In Search of . . .
Extraterrestrials, Magic and Witchcraft, Missing Persons, Myths and Monsters, Lost Civilizations, Special Phenomena. In Search of . . . cameras are traveling the world, seeking out these great mysteries. This program was the result of the work of scientists, researchers, and highly skilled technicians. — End Credits Tag for In Search of . . . This is an educational blog that accepts no advertising or remuneration. Any images not credited to the author of this blog are presented here for the purpose of supporting educational dialogue and therefore meets the definition of Fair Use as defined by U.S. Copyright Law. Travel theme. Theme images by LordRunar. Powered by Blogger.